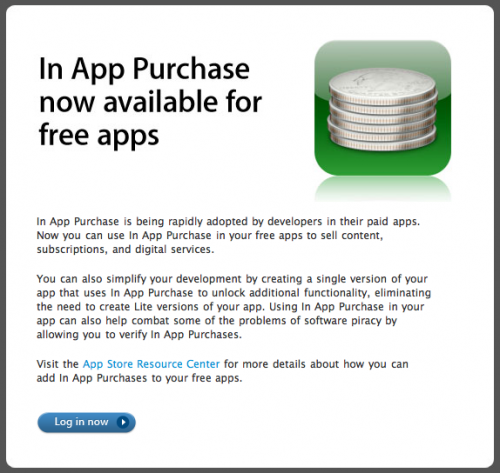 Apple has announced to developers that they are changing the in-app purchase feature of App Store applications. In the past, only paid applications could use the in-app purchase feature however, Apple is now allowing the feature to be implemented into free apps as well as paid apps. I’m not sure what I think about this yet but, I do think it could help clean up the App Store a bit. Instead of developers creating a free lite version of their app, they could just make the application free with an in-app purchase to buy the full game thus eliminating the need for free lite versions of applications.